Last month I wrote about why Netbooks, which are small, low end computers that are selling like crazy, just aren’t good enough for most users. Small screens, small keyboards and underpowered hardware make for a less than stellar Netbook user experience. But Netvibes Founder Tariq Krim, who left Netvibes on a full time basis last May, thinks he can fix that. His solution is an elegant new software stack called Jolicloud – users will download Jolicloud to their Netbooks and then install it. Whatever operating system and software is on the computer will be wiped off, and replaced with a stripped down Linux operating system and custom browser. Jolicloud isn’t ready to launch yet. I did manage to track Tariq down for a few minutes here in Paris to get a demo, though, on a low end Asus Eee PC. He won’t yet share proper screen shots of the user interface, saying it isn’t locked down yet. But I did grab a couple of blurry photos with my phone. 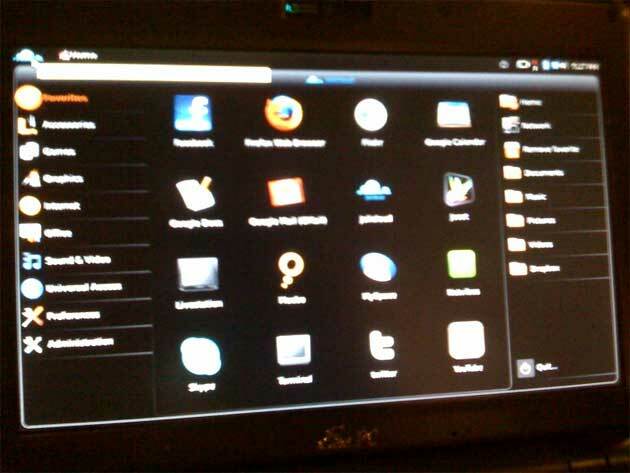 The user interface resembles the iPhone – it includes large icons (easier for viewing on Netbooks) and very little fluff to keep the hardware humming. Jolicloud will also support touchscreens, which will work well with the icon-based navigation. Bookmarked sites are actually individual Prism applications. There are a ton of other features as well, including a planned application platform for third party developers, but the company has asked us to keep our reporting to a minimum until they are ready to release Jolicloud into private beta. Which should, Tariq promises, be very soon. For competition, check out Good OS, which is another stripped down operating system that’s perfect for low end PCs. Good OS is different, though, in that the company is targeting device manufacturers to add it as a dual boot option. Jolicloud is going straight to the consumer to encourage them to try it out. As a heavy tester of Netbooks, I can say that Jolicloud is a huge step forward in terms of usability. Netbooks are so different from normal laptops and desktops that they need their own tailored operating system. Until now that appeared to be Windows XP, which is the OS of choice for Netbook manufacturers. But I expect those manufacturers will take a long look at Jolicloud and consider licensing it, or copying it, soon.